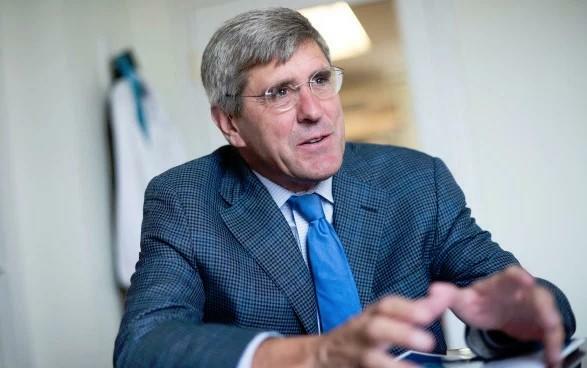 Trump's proposed nominee to the seven-member Federal Reserve board, Stephen Moore, is planning to challenge the status quo at the US central bank, at a time when it needs continuity and stability the most. Moore said on Bloomberg that he is seeking to debunk the idea that growth causes inflation and that he is also going to "try to demystify monetary policy so it’s not conducted within a temple of secrecy." Moore said yesterday: "I’ll say that again: Growth does not cause inflation. We know that. When you have more output of goods and services, prices fall. And I think the Fed has been afraid of growth -- there’s "growth-phobiacs" over there and I think they’re wrong.” Whether or not the FOMC committee will agree with that remains to be seen, it would be perhaps more interesting to hear his position on whether debt causes growth, which is far more topical in a world where to "buy" one dollar of GDP, nations have to increase debt by $3, $4 or more. Last month, President Trump said that he’s planning to nominate Moore for a seat on the Fed’s board of governors. Trump's intentions drew ire and criticism from some circles as a move motivated by politics instead of "sound" economics. Another of Moore's missions that's sure to be a hit with current Fed governors is his intentions to make the Fed more transparent. “I’m going to run on an agenda of transparency, openness. Why shouldn’t Bloomberg and C-Span and others be able to cover everything they do? Why does there have to be this temple of secrecy? So, I want openness and sunlight on the Fed,” Moore said, assuring that his future colleagues (assuming he succeeds in the nomination process) isolate him from any off the record, decision-making huddles. He certainly will never be invited to conference room E at the BIS tower in Basel where all the really important decisions are made every few weeks. Moore further raised eyebrows for pushing the Fed to set monetary policy in response to falling commodity prices and criticizing its rate hikes for undermining Trump’s economy, after slamming it when Barack Obama was in the White House for keeping rates too low. He also called for Fed Chairman Jerome Powell to be fired, though he later said he regretted that remark. Of course, Moore still has to undergo FBI clearance and financial disclosures before being nominated, a process that usually lasts about a month. That said, if he's interested in transparency, perhaps he can start by explaining his recent comments, when he referred to himself as a "growth hawk", a term that nobody seems to understand. “We want wage increases, I want workers to be better off but I’ve said repeatedly when I get at the Fed I’m going to be the growth hawk there. I’m one of these people, I don’t believe in secular stagnation, it’s the stupidest idea I’ve ever heard,” Moore told FOX Business yesterday. Even if he is nominated, he is certain to get the cold shoulder from his Fed colleagues: as Bloomberg reported today, Fed officials, "in their polite and coded way", have already issued a veiled warning for the political loyalists that President Donald Trump is trying to insert into their ranks: We don’t do flimsy economics, which of course is hilarious for a central bank which last October said the neutral rate was "far away", and just two months later had to make a humiliating U-turn after the market slumped into a very brief bear market. And by technocrats, he means people who check the S&P several times every hour, ready to launch QE or issue a dovish soundbite should the "wealth effect" ever be threatened and jeopardize the social order with even a modest correction. (3) First, my impressions of Steve Moore. I was certainly ready to disagree with him. What I met was a remarkably genuine person displaying serious humility. I didn't detect even a twinge of arrogance. Quite the opposite. Collum note that Moore told students to question authority. "Experts can be dead wrong," Moore said. (4) He opened urging the students to question authority: "Experts can be dead wrong." Don't we all know THAT one. A kid in Q&A said "I would defer to a professor." I blurted out "Nooooooo!" Moore also apparently stressed a goal of zero inflation and holding prices fixed. (6) In stream of consciousness series of pros and cons, I was hopeful when he stressed the goal of ZERO inflation. Holding prices fixed. Period. I, of course, doubt the Fed's ability to do this but I heard no 2-3% inflation target. cc @McClellanOsc on THAT one. Moore also didn't seem to loathe or laugh at the gold standard, like almost every other Fed governor and academic over the past few decades. (7) Pressed on his support for the gold standard, his answer seemed to back peddle from a strong pro-gold stance years ago, but he finished fairly warm to the idea: "we could do a lot worse." He also noted that he "detests corporate welfare" and ended his conversation with a great one liner: "Monetary policy cannot correct for bad economic policy." Moore also called MMT the "most insane concept imaginable". (21) Great line: "Monetary policy cannot correct for bad economic policy." I'm using that one. (23) Moore brought up MMT and denounced it as the most insane concept imaginable. A bunch of us were laughing at mere mention of it. You can read Collum's entire interaction with Moore in this thread.